Windows Phone users have a new way to shoot video to the big screen. Tube Cast is a free app that streams YouTube to Chromecast over your WiFi network. Windows Phone users now have a new way to send their favorite YouTube videos from their phone to the big screen. Tube Cast is a free app that will stream YouTube videos to Chromecast over your WiFi network. This is one of the first third-party apps to come along since Google made the official Chromecast SDK available to developers. And surprisingly this one is created for Windows Phone. 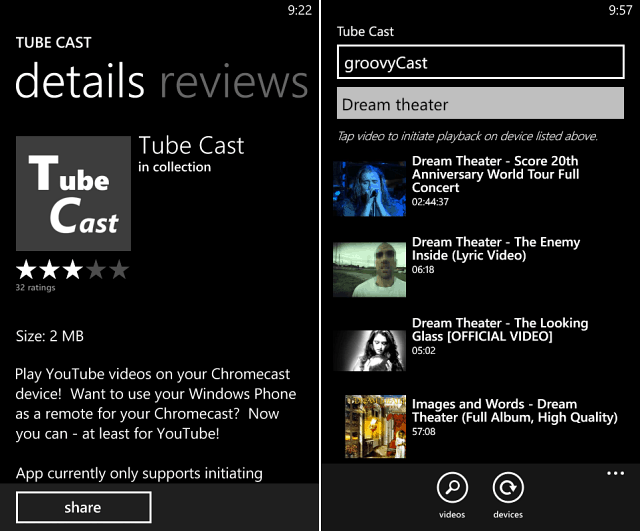 Download TubeCast on your Windows Phone and launch it. The app should find you Chromecast(s) right away, if you have more than one just select the one you want to watch videos. Then you can start searching for videos on YouTube. Then simply tap the video to initiate playback to your Chromecast. The app is in version 1.0 stage and provides playback of videos, but currently it doesn’t have the ability to pause, stop, or rewind. But you can continue use other apps on your phone while it’s shooting the videos to Chromecast. But hopefully in future iterations more cool features will be added. So, it’s definitely bare-bones compared to native Chromecast support in YouTube or on Android or iOS devices. However, it’s definitely a step in the right direction. Let’s face it, unless you’re really into tech gadgetry, chances are you don’t have a Windows Phone to start with, let alone a Google Chromecast. But if you do have both, definitely check out the Tube Cast app. While there’s more work to be done on it, this is the first app that allows you to use Chromecast on Windows Phone. It will be interesting to see what other third-party apps come out on different platforms and mobile devices that will start using Chromecast.